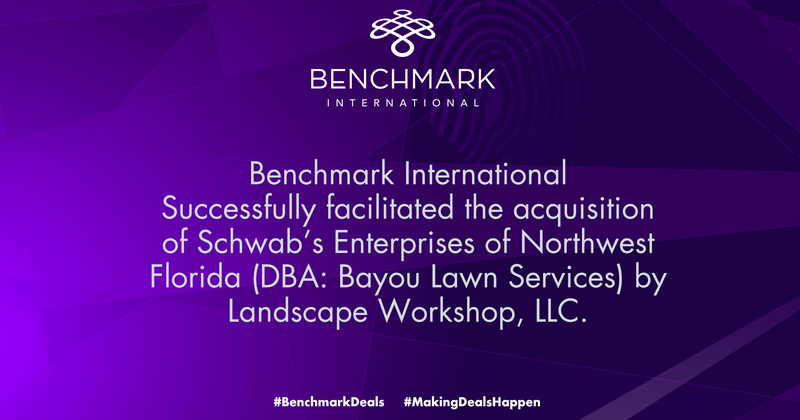 Benchmark International has successfully facilitated the acquisition of Schwab’s Enterprises of Northwest Florida (DBA: Bayou Lawn Services) by Landscape Workshop LLC. Bayou Lawn Services provides professional landscape maintenance and installation, irrigation installation and repair services to commercial and residential clients. Landscape Workshop is a full-service grounds management company that has been providing professional service and expert maintenance for outdoor commercial spaces for more than 30 years. Landscape Workshop’s goal is to help its’ customers achieve business goals, maintain property value, and attract customers and tenants. The company has the ability to serve properties throughout Alabama, Arkansas, Kentucky, and Tennessee, as well as parts of Georgia, Mississippi, and Florida.